"Herbalife products changed my life!" That's what millions of excited people have said about their life-changing success using Herbalife products! From simplified nutrition to weight management and naturally enhanced beauty, Herbalife products can change your life, too. Read about some of the results here with these inspiring, healthy success stories! Herbalife Weight Management Program Statement: All weight loss claims refer to the Herbalife Weight Management Program which includes, amongst other things, a calorie-controlled diet, regular exercise, an adequate daily fluid intake and appropriate rest. Di Suter - from Gran to Glam! My name is Di and I was an overweight, 50-year-old who had been merely existing for the past three years. After a depressing retrenchment, I comfort ate and nothing brought me any joy! But as luck would have it, I found Herbalife and it was the kick-start that I needed to a better me. I lost weight consistently over the next three months. With each passing week I started to feel better about myself and losing 6.3 kilos was a prize in itself.I know how to continue losing weight healthily until I reach my goal weight. My whole outlook has changed and I feel on top of the world and have a new joie de vivre. Thank you Herbalife and for the support of my Herbalife coach. Di Suter tip: I found I saved a huge amount of money that I used to spend on junk food and treats! My name is Melenie Govender. I am 28 years old, mother of 2 and have a fulltime job.. I always felt tired and drained and I was told that it would be an absolute mission to lose weight! I lost 5kg’s, 30cm and 2% Bodyfat. I feel and look amazing! Thanks to the amazing Herbalife products I feel like a completely new person. I have gained my self esteem and feel more confident than I have ever been. Thanks HerbaLife you are AMAZING!!! My name is Antoinette Watkins from Pretoria. I am 47 years old and a grand mother of a beautiful 3 year old boy. I lost an incredible 10kg’s, 13% bodyfat, 46cm and I fit in my size 34 jeans! I also use Herbalife’s anti-ageing skin care products – with amazing results! Thank you Herbalife for a fantastic, Healthy lifestyle! I lost 10kg’s and 38cm in a 12 week Weight Loss Challenge! I have loads of energy! Janet Cushway. "I've reached my goal weight"
Last year both my parents passed away and to fill the void I ate and ate and put on a lot of weight. In desperation, I started going to the gym and exercised really very hard for 16 weeks and only lost 3 kgs. A friend contacted me about the Herbalife products and I started losing weight and feeling fantastic. Family and friends started noticing and after 4 months, I had lost 16 kilograms and have reached my goal weight. Still people comment and ask me what am I doing? I now help them change their lives. It is a great feeling! Janet’s tip: Keeping a positive attitude and exercise helps with weight loss! George Lazlo "Sceptical at first! Now I feel, if I can do it, anyone can!” I come from a design engineering background with working pattern of long hours on computers and having a lot of stress I put on a lot of weight. Together with the weight I developed weight related problems. In November 2002 I got on the product and although I was skeptical and cheated a lot, I still lost 6 kg and felt really good for the first time in a long while. Encouraged I lost another 6 kg and that really opened my eyes! I have come down 5 sizes of pants (32 from 44) and feel like a young man again! In the last 2 years, by using the outer nutritional products my skin improved dramatically. 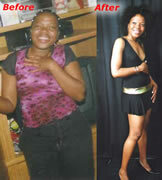 Michelle Mchunu "Herbalife changed me completely!" Before Herbalife I was overweight, tired, had no confidence and low self esteem. I was introduced to Herbalife 6 years ago, within 3 days I felt so great, my skin started clearing up and I started losing weight! I have got my figure back and gained my confidence! I feel absolutely GREAT! I am so happy with what these product have done for me." Herbalife Weight Management Program Statement: All weight loss claims refer to the Herbalife Weight Management Program which includes, amongst other things, a calorie-controlled diet, regular exercise, an adequate daily fluid intake and appropriate rest. No medical claims of any nature are made or intended in any of the stories submitted. * Disclaimer: No medical claims of any nature are made or intended in any of the stories submitted. The experiences of the parties concerned are their own personal experiences and the results obtained may vary from person to person. No guarantee is given or implied that you will experience the same results, as this depends on your adherence to the program.